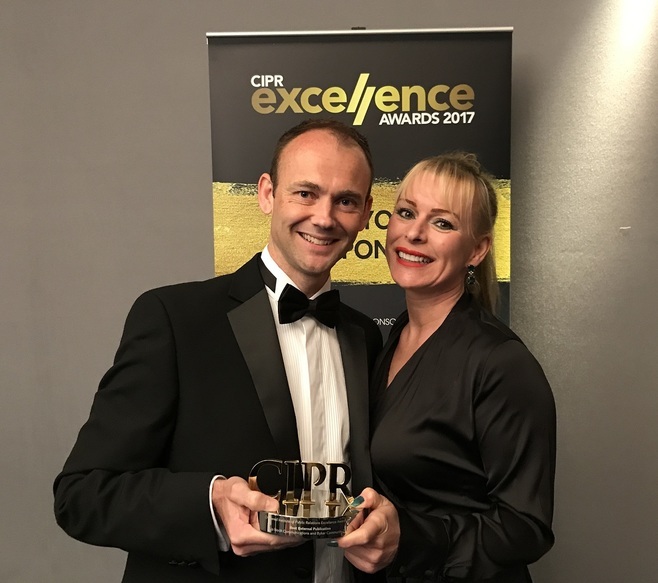 PR, marketing and communications agency Up North Communications is celebrating after winning a national award at the Chartered Institute of Public Relations (CIPR) Excellence Awards in London last night. The two-year old agency was the first tenant to move into The Hub in Washington and was one of only three organisations representing the North East. The award for ‘Best External Publication’ was in recognition for a newsletter they produce for their client, Byker Community Trust (BCT) – a housing association which owns and manages 1,800 homes on the iconic Grade II* listed Byker Estate in Newcastle. The awards, which recognise the creative work that is produced within the PR industry, are the most rigorously judged in the public relations profession and the winners are carefully selected by a panel of industry experts. The publication saw off competition from companies such as Macmillan Cancer Support, the Police Federation of England and Wales, University of Derby and Writtle University College who were all worthy winners. This is the second award that the newsletter has been recognised for after winning gold for ‘Best Publication’ at the CIPR PRide North East Awards in December. It aims to raise awareness of the progress that BCT is making, advise of projects and services that the organisation is delivering on the Estate, promotes forthcoming activities and community events, encourages community engagement and participation and improves communication between tenants, stakeholders and the organisation. Craig Downs, Managing Director of Up North Communications, said: “This is a fantastic achievement not only for Up North but also our client. To deliver a publication that is not only a regional but national CIPR award winner is credit to everyone involved, helping to deliver our clients’ brief and a publication they can be proud of.